EDIT: Giveaway is officially closed. Congratulations to the randomly chosen 477th commenter, Alex. The autumnal equinox is looming near - is your wardrobe ready for fall? Jessica of J.C. Jewelry is giving away one amazing accessory which can be worn to enhance several of the coming season's Pantone fashion colors. 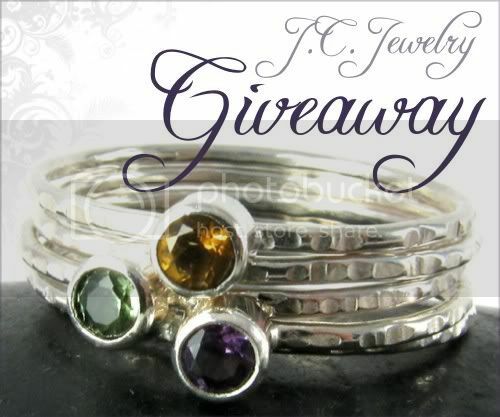 One winner will be able to mix and match a custom sized set of gemstone stacking rings, retailing at $95. The shiny set of five comes with two plain 1mm textured sterling silver bands and three bands embellished with a 3mm gemstone in harvest colors - citrine, peridot and choice of amethyst like the photograph above or the garnet like the button at the bottom. Jessica only works in pure metals, no plated or filled materials. Her style is modern and sometimes edgy, but always classic. She is inspired by basic concepts and facets of humanity and psychology. She likes to ponder how in certain combination, colors, textures, and shapes can tell a story or make the wearer feel differently about themselves. Jessica strives to create quality jewelry that is not only beautiful by itself, but compliments the body. Giveaway is open worldwide to entrants at least 18 years old. I will be pulling a number from my random.org top hat after 11:59pm EST on September 15, 2011, and the corresponding commenter will win! Jessica will contact that lucky soul for a mailing address. If she doesn't hear back from the winner within 3 days, a new number will be drawn. Mandatory Entry: Circle around the J.C. Jewelry Etsy shop then comment on this post with your favorite handmade item and a way to contact you, preferably an email or Etsy shop. 1. Add that same item to your favorites AND heart her shop. Leave a comment with your Etsy username. 2. Get 20% off anything in Jessica's shop by using coupon code "Sep20" and comment here with what you bought. The coupon code is valid through all of September, so if you don't win the rings, you can purchase a set afterward at a discount price! 3. Like this giveaway on facebook by using the like button at the bottom of this post and comment with your profile link. If you have a facebook business page, you may also share it there for another entry. 4. Like the J.C. Jewelry AND aquariann Art pages on facebook for one extra entry. 5. Follow Jessica AND aquariann on twitter. 6. Tweet once about the giveaway using the one below or a variation of your own. Leave a comment with the link. 7. Vote for my blog just by clicking Picket Fence Blogs. You may do this once a day. 8. Spread the word! Give this post a + 1 on Google or pin it to Pinterest. Click to share this giveaway on Stumble Upon, Technorati, Digg, or Del.icio.us. I'll honor one entry for every networking website you share it on, just make sure to leave separate comments for each. 9. Reblog my post on tumblr, just leave a separate comment to let me know. 10. Blog about it or copy and paste the button code below to your sidebar! What beautiful jewelry--I'm happy to enter. My fave piece is the onyx necklace though the halo earrings are cool too. I liked the post via fb as Dorottya Zsófia Bacsi. I like both fb pages as Dorottya Zsófia Bacsi. I follow both twitter pages as doroffee. Spectrolite Labradorite Pendant Necklace with Gemstone Cluster is my favourite. I love the colour of the gemstone. I have given the shop and the Labradorite Pendant a heart. My favorite piece is the copper and sterling spinner ring--I actually fell in love with it a couple months ago when searching for spinners. I love Jessica's 3mm Sterling Gemstone Stacking Ring rings, so simple and beautiful. I am really starting to get into the whole stack ring thing, and hers are fabulous! Gorgeous work! My favorite piece is the "New Beginnings Labradorite Cocktail Ring", which I hearted with my Etsy username "Beadmask". Shop & item have my heart! Liked both of you on Fb. I'm in love with the Rose cut Rose Quartz ring!! MoonRae had already hearted J.C. Jewelry on etsy,but hearted the Rose quartz ring. The Labradorite and Amethyst Sterling Silver Earrings are simply lovely!! I love the Silver Sprouting Leaf Ring - lovely and simple. I would seriously wear her whole collection! But my favorite is the Wildflower cluster necklace! I Liked her on fb and tweeted! I loveee the Labradorite and Amethyst Sterling Silver Earrings! Absolutely love the Green Onyx and Sterling Necklace. Lorax43 added this to my favorite items and she has been on my favorite shop list for awhile! Like both sites on facebook. Have been a fan of JC's for awhile but liked aquariann! I favorited and hearted! Also liked the two facebook pages! And am following both people! Tumbled it to! My Etsy shop is EeeBeeDee! hearted and faved item under squirrel33 . ilove the set of three copper cuffs! I love the Sterling Silver Flower Stud Earrings. In love with the rose cute amethyst ring. Everything is gorgeous in your shop though! I added the item and hearted your shop! My favorite item is the Sterling Silver Flower Post Earrings with Freshwater Pearls. I love the Sterling Silver and Freshwater Coin Pearl Earrings! I favorited the stacking rings and Jessica's shop - I'm kacijohanna on Etsy! Beautiful jewels!! I love the wildflower cluster necklace. My favorite other than the stacking rings would be the Tibetan Turquoise and Sterling Silver Ring. All the pieces are beautiful. I love the moonstone ring! I added JC Jewelry and the Tibetan Turquoise and Sterling Silver Ring to my favorites. Following both of yall on twitter. My favorite is the Spectrolite Labradorite Pendant Necklace with Gemstone Cluster! Love the Abstract Flower Sterling Silver and Copper Stacking Ring. I love the Sterling Silver Flower post earrings with freshwater pearls. My favorite item is the Sterling Silver Flower Post Earrings with Freshwater Pearls! I added the earrings and her shop to my favorites! I like the post of Facebook! I like J.C. Jewelry on Facebook and already like aquariann! I love the Soft Pink - Sterling Silver Wire Wrapped Chalcedony Briolette Necklace. Gorgeous! I like Copper and Silver Disk Chandelier Earrings with Carnelian. I like the Botanical Copper and Silver Bracelet - Astral Vine. I heart the Botanical bracelet as Domum Vindemia. I follow you both on Twitter - dspdavey. I, Ting Li, liked this post on facebook. I love the stacking rings and I also love the Vessonite and Beer Quartz Sterling Silver Cluster Earrings, which are also very nice colors for Autumn. She's got a ton of gorgeous stuff but I particularly love all of her stacking rings! I like both of your pages on Facebook. Button code added to sidebar. Add that same item to your favorites AND heart her shop. Follow Jessica AND aquariann on twitter. I absolutely LOVE the Skinny 1mm Sterling Silver or Copper Leaf Ring! I love the Handcrafted Heart Cuff Bracelet. I really like the "Rose Cut Rose Quartz Ring" also. Favorited my choice and hearted the shop under ewalsh40. Liked J.C. Jewelry AND aquariann Art pages on facebook. I am so glad you featured this shop. I'm always looking for good jewelry finds on Etsy. A fave from her shop - definitely the Skinny Sterling Silver/Copper Leaf Ring.